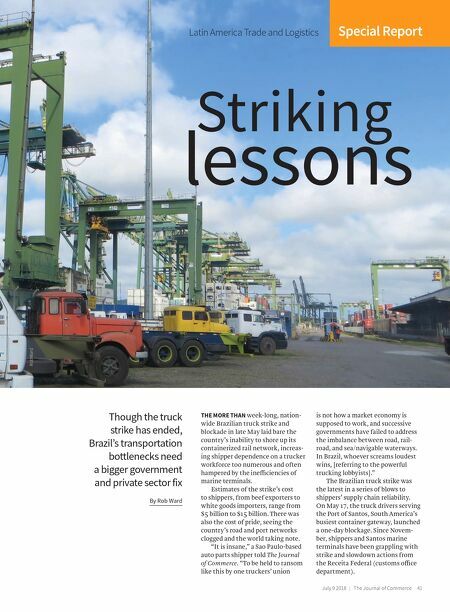 Rob Ward Latin America Trade and Logistics Cover Story Special Report July 9 2018 | The Journal of Commerce 41 www.joc.com Striking lessons Though the truck strike has ended, Brazil's transportation bottlenecks need a bigger government and private sector fix By Rob Ward THE MORE THAN week-long, nation- wide Brazilian truck strike and blockade in late May laid bare the country's inability to shore up its containerized rail network, increas- ing shipper dependence on a trucker workforce too numerous and often hampered by the inefficiencies of marine terminals. Estimates of the strike's cost to shippers, from beef exporters to white goods importers, range from $5 billion to $15 billion. There was also the cost of pride, seeing the country's road and port networks clogged and the world taking note. "It is insane," a Sao Paulo-based auto parts shipper told The Journal of Commerce. 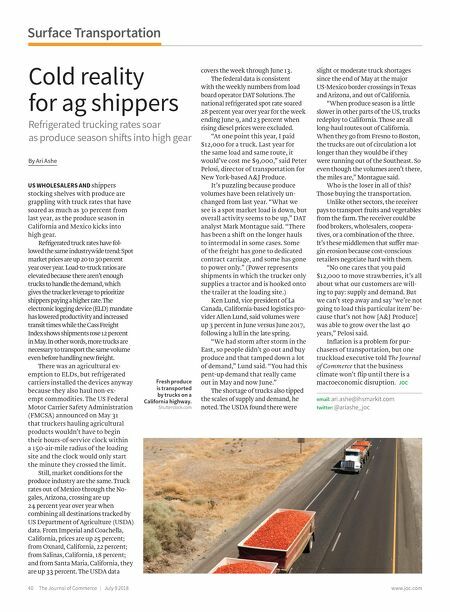 "To be held to ransom like this by one truckers' union is not how a market economy is supposed to work, and successive governments have failed to address the imbalance between road, rail- road, and sea/navigable waterways. In Brazil, whoever screams loudest wins, [referring to the powerful trucking lobbyists]." The Brazilian truck strike was the latest in a series of blows to shippers' supply chain reliability. On May 17, the truck drivers serving the Port of Santos, South America's busiest container gateway, launched a one-day blockage. Since Novem- ber, shippers and Santos marine terminals have been grappling with strike and slowdown actions from the Receita Federal (customs office department).